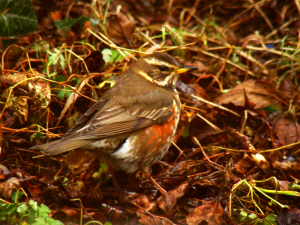 Observation - Redwings - UK and Ireland. Description: SMall migratory thrush from European mainland with distinctive red patch on flanks. Guide-book says underside of wings also red but not observed in this instance. Feeding in typical thrush behaviour amnong leaf litter. SMall migratory thrush from European mainland with distinctive red patch on flanks. Guide-book says underside of wings also red but not observed in this instance. Feeding in typical thrush behaviour amnong leaf litter.